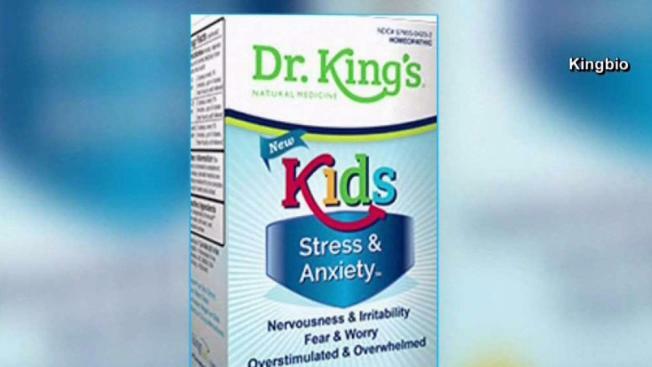 King Bio has announced it is pulling all of its water-based products across all brands, amounting to more than 50 products intended to treat virtually every ailment from migraines to allergies, amid a national recall over concerns about possible purity issues. The company's founder, Frank King, announced the expanded recall in a statement on the website Monday. Nearly three dozen children's medicines have already been recalled over the microbial contamination fears. King Bio, a North Carolina-based company that makes homeopathic drugs, first said last week that a small percentage of its products produced between Aug. 1, 2017 and April 2018 tested positive for the microbial contamination. There were still no reported illnesses as of Monday, and King Bio said it was notifying its distributors and customers by letter to arrange for return and/or replacement of all the affected medicines. The recalled products are used to treat dozens of conditions, including allergies, migraine, anxiety, bed wetting, chicken pox, common colds, nosebleeds, sore throat and teething. Products meant for use on pets are also being recalled. They were sold nationwide between August 2017 and July 2018. "We are truly sorry for the inconvenience or concern our recall may have caused, but we felt this was the right thing to do to maintain your trust," King said in a statement. "Thank you for your continued loyalty and confidence in our King Bio products." Customers are urged to stop using the affected products immediately and contact King Bio by email at recall@kingbio.com or call the company at 866-298-2740, Monday through Friday from 8:30 a.m. ET to 3:30 p.m. ET. Consumers who believe they may have been sickened by one of the recalled products should contact their physician or healthcare provider. See a list of 32 the affected kids' medicines below. For a complete list of UPC and Lot numbers click here. Find all the recalled adult medicines here.